Your site title is the bit of text that you see at the top of your browser when you’re visiting your website. This tells search engines what the overall name and topic of your site is. Google and other search engines mark this as one of the most important things for helping them determine what a site is about, with the first words getting more weight than words later in the description. I see lots of people starting out simply naming their site “Blog” or simply their photography name. It’s going to be easy to rank for your photography name, especially if it is your own name, so if you add this you should put it at the END of the title, not the start. The first few words should be words you want to show up for when people are searching. 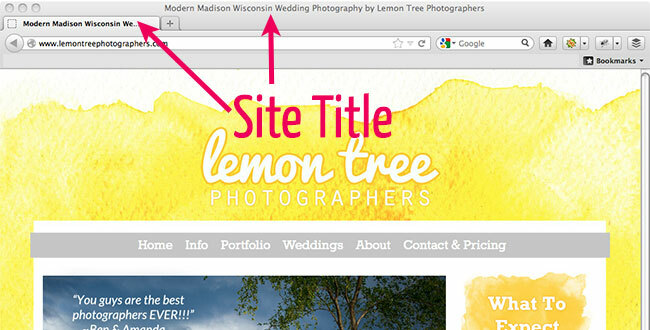 So by looking at our site title, you can see that we’re looking for people who want a more modern approach to wedding photography that are located in Madison, Wisconsin. In WordPress, you can change this by going to Settings, then General, then type in a new site title and click “Save” at the end. Bonus tip: You can also add a descriptive tagline right below, which will sometimes show in the description of your site when people find it in the search results under the main title. Search engines can’t “see” what your images are because they are machines, so we use alt text to tell them what the photo is. Alt text is a bit of extra text you enter when you post images. This should describe what the image actually is and shouldn’t be a place that you simply stuff lots of keywords. Doing that can actually hurt you, so don’t do it. 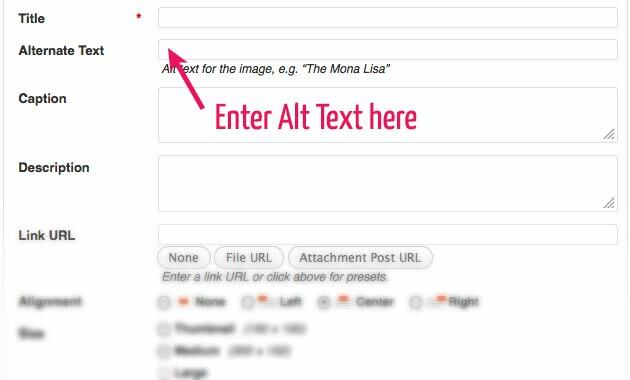 Bonus tip: Add title text as well (right above where you enter alt text). This can take a lot of time if you are adding several images, but it’s worth the extra time it takes if you’re serious about getting your site to rank well. Because search engines also look at your url to help determine what the post is about, this doesn’t tell it anything except some random numbers. Where you’d replace “post-title” with the name of your post (which would contain keywords you want to rank for). If you’ve already been blogging for awhile and your blog isn’t BRAND NEW, then there’s two steps to doing this. First, you need to change the structure of your Permalinks to show the post name (and possibly category if you want to do that too). Second, you need to tell search engines that you changed the structure (because it will change past links too!). Thankfully, this is easy to do with a simple plugin. Here’s a great post about how to change your permalink structure and how to make sure that search engines see that you’ve changed them with a simple plugin. Bonus resources: for those who really want to rock this! I think SEO is one of the most effective ways to get new clients, so it’s worth digging into and learning about. Here’s some extra resources for you that I think are the best out there for really helping you rank higher in search engines to see results. Everything you need to know about setting up a self-hosted website that will get you results. If you don’t have a self-hosted website and are using some other sort of free alternative, stop it now and read this article! 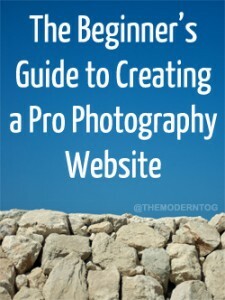 An ebook that is written specifically for photographers to help rank higher in search engines. While there are lots of free resources online that will teach you about SEO (Search Engine Optimization), this one is worth it for how it holds your hand and walks you through each part step-by-step, as well as what is most important for photographers and specifically what you should be thinking about as you do it. It’s the closest thing out there to someone doing it for you without having to pay them big money. If you use this link in this post to buy it, I get a small commission, so thanks much! This is a completely free guide that will help you learn the principles of SEO and how to implement them. 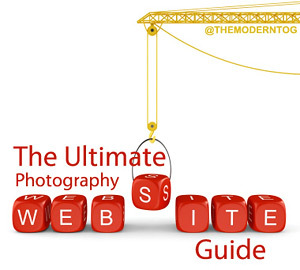 While it isn’t written specifically for photographers, it’s still a very useful resource. If you can’t turn your new visitors into clients, all this optimization is worthless. This post has lots of resources that tell you how to get your website found, how to turn your new visitors into paying clients, and how the design of your site will impact your business (along with lots of other resources as well).